Today's card is one that I'm creating as part of a gift set. I have lots of gift sets still to make, so I'm trying to keep them as simple as possible. I'm trying to vary the design of the card so that you won't get tired of looking at the same thing each day! Cardstock: PTI; Patterned paper: American Crafts, Stamps: SASI; Ink: Memento Tuxedo Black; Copic markers; Cuttlebug embossing folder, Nestabilities square, Pebbles candy dot, Other: ribbon (reasonableribbon.com), foam tape. 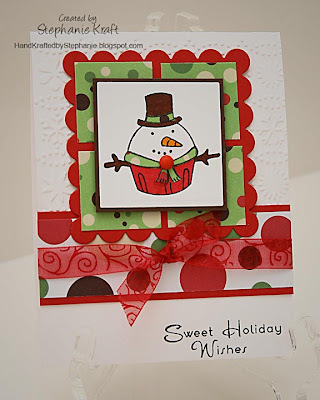 Love the fun image, polka dotted DP and ribbon!